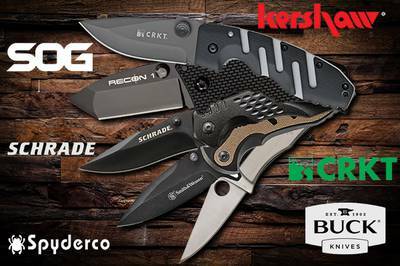 Enter your email address below to receive a notification when Knife Subscription Club starts accepting new sign-ups! Enter your email address below to receive a notification when Knife Subscription Club is accepting new sign-ups again. Our shipping window is between the 15th and the 25th each month. Please order by the 9th to get the current box. Knife Subscription Club is your fast and affordable way to grow your knife collection. When you subscribe, you get a new, brand name knife and/or EDC gear sent to you every month on autopilot. We can promise that all of our knives are high-quality, stainless steel with a spring assisted opening! We now offer a Ladies Collection as well! Free U.S. shipping and USPS trackable shipping! Good value, a few small filler items but overall a good usable selection. All i can say is awesome knife and awesome service. Cant wait for the next box. I subscribed, didn't receive my first box and they tried to charge me for a second month, several weeks early. I canceled and requested a refund - with no response. Do not recommend. Hi Renee, We correspond with members every day and unfortunately we haven’t received any emails from you. If you’ll look at our FAQ page you can see that your first box was scheduled to be shipped this month (Feb 2019) during our normal shipping window: https://www.knifesubscription.club/faq WHEN ARE ORDERS SHIPPED OUT: “We typically ship orders out between the 15th and 25th of each month. Please note that your order must be in by 5:00 PM CST on the 9th in order to be shipped out the same month, otherwise your order will be shipped out the following month during our normal shipping window.” Since your order came in on the 17th of January, your first box is scheduled to go out this month. We’ll also be happy to work with you to get this resolved.